What day is this? Is it already Christmas? This Halloween was fun and exhausting. I am already dreaming of sugar plums and humming Christmas songs. Planning my Thanksgiving menu. This weekend I made the Candy Corn Cupcakes. The kids needed a little treat to help them stay awake while we carved pumpkins. The adults needed a sweet treat to help us make it through Halloween night. I made Lemon-Lime Cupcakes with Lemon-Lime Mascarpone Frosting. 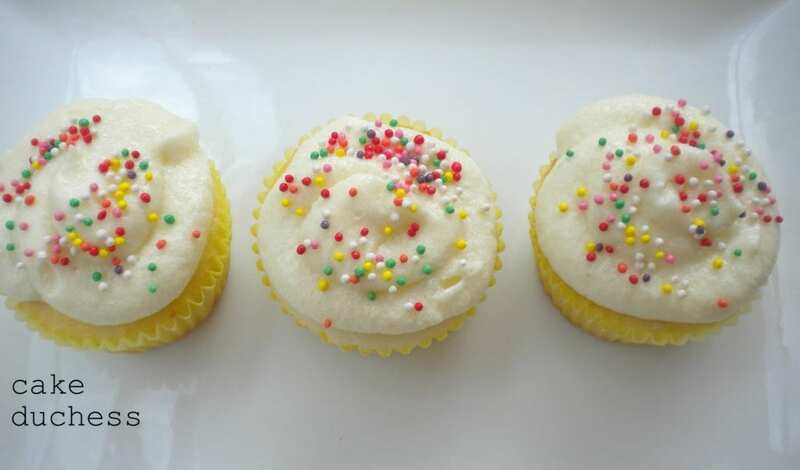 These cupcakes are very moist with a perfect hint of citrus flavors. I bought 24 limes for $1.00 the other day. I had to incorporate them into a cupcake. I think I made the right choice. So before you start your Christmas cookie baking marathon, have a cupcake that is full of sunshine and that reminds you of summer. Preheat oven to 350 degrees F. Line the muffin tins with cupcake liners. In a medium sized bowl, whisk together the cake flour, baking powder, and salt. Combine the egg whites, buttermilk, sour cream, lemon juice, and vanilla extract in a medium sized bowl. Cream the butter, sugar and lemon/lime zest on medium speed for about 5 minutes (the butter/sugar should be very light). On medium speed, mix in about 1/3 of the flour mixture, and blend well, taking time to scrape down the sides of the bowl of your mixer. On medium speed, beat in 1/2 of the buttermilk mixture, then beat in the remaining 1/3 of the flour mixture. (make sure that the zest gets well incorporated). Be sure to not over mix the batter. Scrape the sides of the bowl to make sure you incorporated all of the lemon and lime zest and gently fold the batter. Scoop batter evenly into muffin tins, filling each cup about 2/3 full. This makes about 24 cupcakes. Bake at 350 degrees for about 30 minutes. 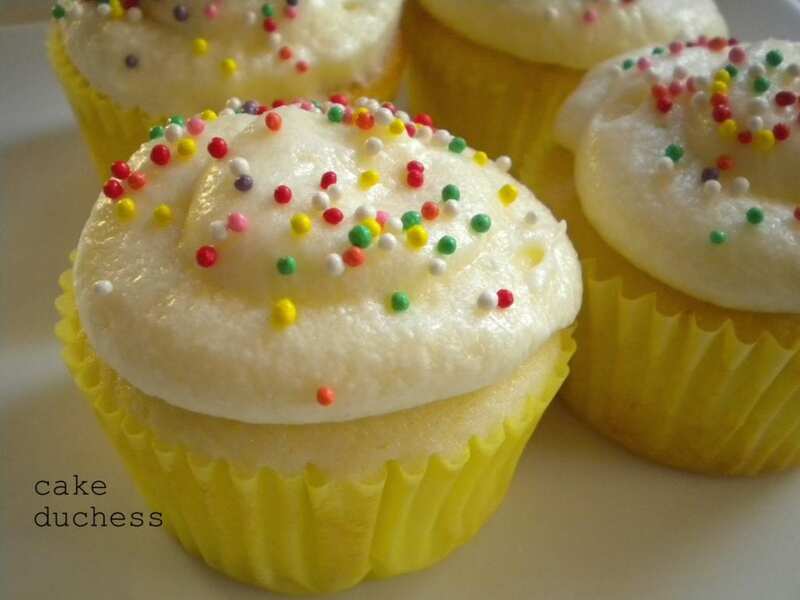 Cupcakes are done when a toothpick inserted into the center of a cupcake comes out clean. In a medium sized bowl, beat the butter and mascarpone until it is nice and fluffy. Add the lemon juice and zest and the lime juice and zest. Beat in on medium speed 1 1/2 cup of confectioner’s sugar. Add more confectioner’s sugar in 1/4 portions. Test the sweetness. I did about 1 1/4 cup of confectioner’s sugar total. Pipe the frosting onto the completely cool cupcakes. You could also spoon it on. Add some sprinkles. Enjoy! 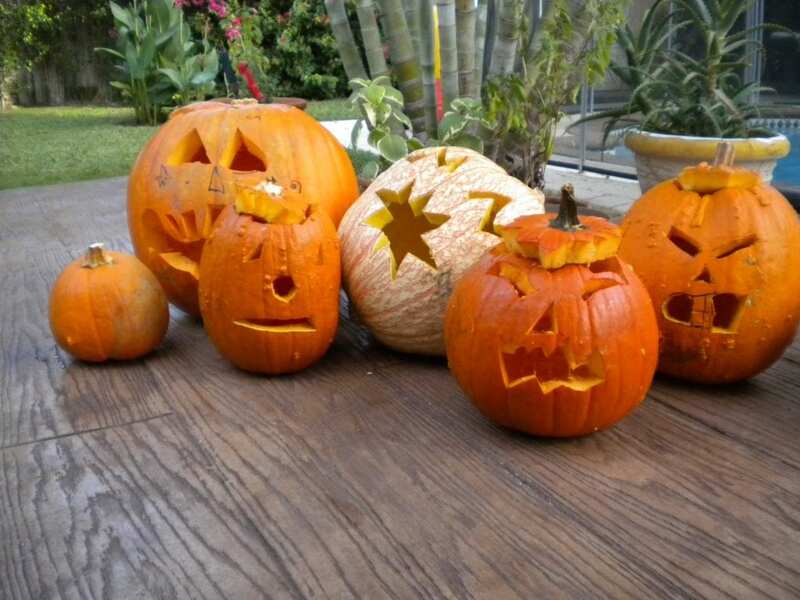 The pumpkins we carved this past Saturday…aren’t they cute? One of the fabulous houses that let the kids walk in and help themselves. This explains the 40 lbs of candy. You have to know that I'm a big lemon fan. But if to that you also add a lemon-lime MASCARPONE frosting…you'll have me drooling over this page for several days! Those cupcakes look gorgeous! The combination of lemons and limes sounds cool! I love how they make a dessert like cupcakes so much lighter. Oh, and that girl's costume is pretty amazing! I love the hint of summer. One day it was 75 degrees here in Pittsburgh and the next 50. I've never tried a mascarpone frosting before, but wow does it sound good! The chicken costume is amazing! I am a big fan of the homemade costumes. The cupcakes look and sound delicious! Light as feather cupcakes, and so pretty too! Lora-I have an award for you to pick up at my blog too. You truly deserve it. Congratulations! I'm a big fan of anything citrus and since I have a lemon and a lime tree bursting with almost ripe fruit in my backyard I'm bookmarking this one :o) Thanks for sharing, they sound and look divine! I could feel the tartness and taste them just from the pics! Love the lemon-lime flavors. The chicken costume is great! How fun, glad you had a great Halloween! 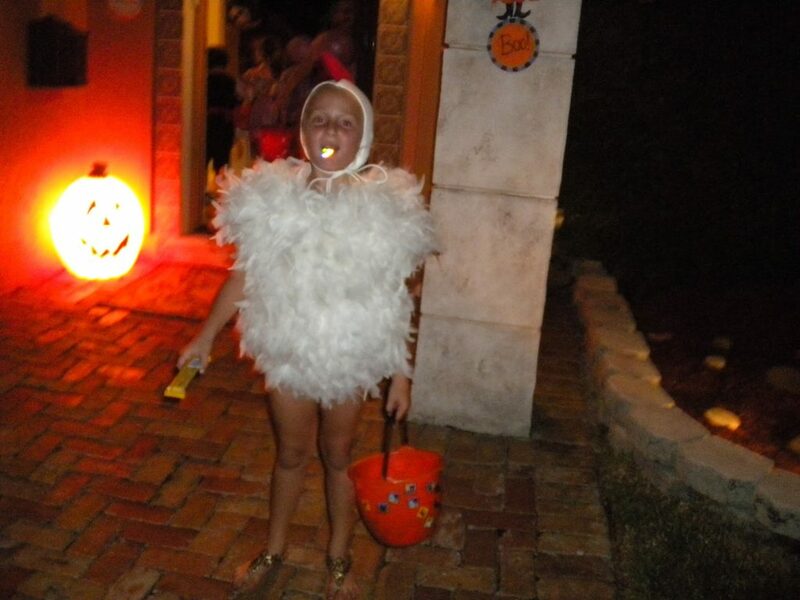 I love those Halloween pictures- the chicken costume is great! These cupcakes look fantastic.. I'd totally eat one right now. 40 pounds? I love the little chicken heart-breaker. =) Citrus cupcakes are my favs…man, I want some! Oooh, those do sound like sunshine. I love the sweet-tart-citrus idea. Your little chicken was darling! Like you, I am ready for the next holiday as long as it doesn't require 40 lbs of candy once again! These cupcakes are perfect with that gorgeous frosting. Those cupcakes are gorgeous, but your kids are pretty darn cute too! Oh my goodness! I love the chicken costume…it seems fitting with this bright and delightful cupcake! I too am looking forward to Holiday baking…but it sure is nice to see something so light and refreshing. Thanks for sharing! egg whites, butter milk, all that baking powder- these must have the most amazing texture! Lemon Lime is always good for me. 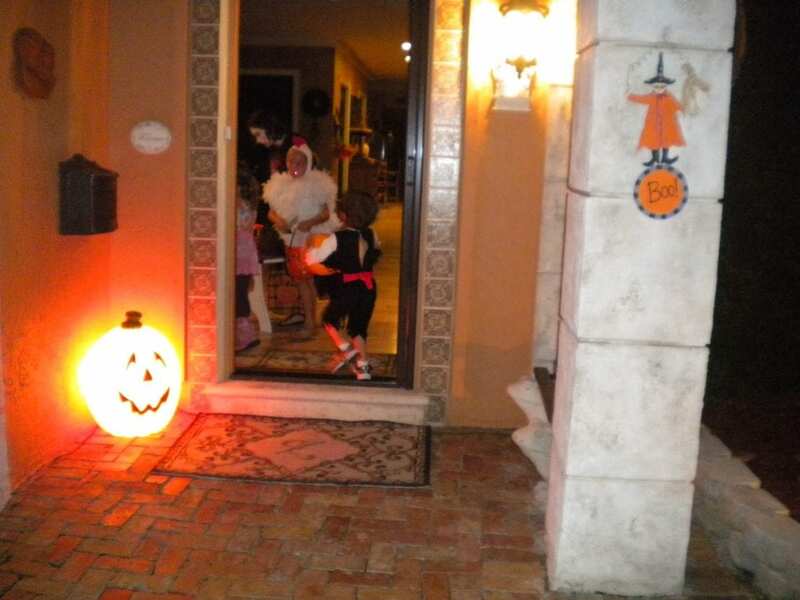 And love the Halloween photos. Could see you have a very fun filled halloween…those cupcakes do look very festive and tempting! I always love a little bit of summer inspiration in my life 🙂 These cupcakes look like the perfect treat! These cupcakes sound delicious and are so pretty! The flavor must be so refreshing and light with the citrus. Yum! Your daughter's comment made me laugh out loud! You make the prettiest cupcakes hun!! Umm, how did I not see this before. Yum! Brilliant cupcakes. I love your blog, and am a new follower! I went to make these but then got confused by the instructions when it said cream butter and sugar . . . How much butter is supposed to be in the cupcakes? I don't see it on the ingredient list.